At 32 and after 20 years of running (x country and track) I only recently had a partial meniscus removal in the left knee. Post operation the Doctor told me no road running, however that I could play football matches, so long as I did not train, and take part in other sports. My physio, stated, without wanting to override the Surgeons advise, that the Doc/Surgeon is not looking at the big picture and only advising you as what is best for your knee - and advised that it should be possible for me after rehab to run once or twice a week on grass. I have returned to running about 35-45k (quality) a week and substitute the remaining mileage/kms with Cross Training and Weight training etc....with all running being on grass, bar the odd 5k road race and my track sessions on tartan. Am i asking for trouble down the line? 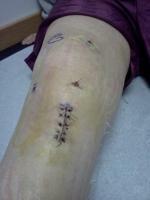 My Knee feels fine, no bothers no issues - 10 months since the op. Physically I am a lean 6ft 4 and only weight 80kg, and work on strength on the knee to help out on impact. My lifestyle takes a dramatic swing when I am not focused on Athletics and thus am at the best state of mind when I continue to exercise and race. Thus don't want to quit! I was also contemplating having a damage assessment done after a couple of years training to see if this could determine the impact that my continued running is having - is this possible?? so that I could re assess development of any longer term damage at a later stage?